Feel the heat of Spain’s traditional dance with a 1-hour flamenco lesson and show at one of Madrid’s top flamenco venues. Leave your inhibitions at the door and get ready to stamp and clap along as you are taught how to flamenco by some of the city’s top dancers during a 1-hour class. After working up a sweat, unwind with a drink or upgrade to include a 3-course dinner with wine before enjoying an electrifying performance from some of Madrid’s best flamenco dancers. Uncover the mysteries of one of Spain’s most popular dances at one of Madrid’s biggest flamenco venues. Make your own way to the venue to start your flamenco experience with a 1-hour class, delivered by one of the tablao’s very own award-winning flamenco dancers and a guitarist. 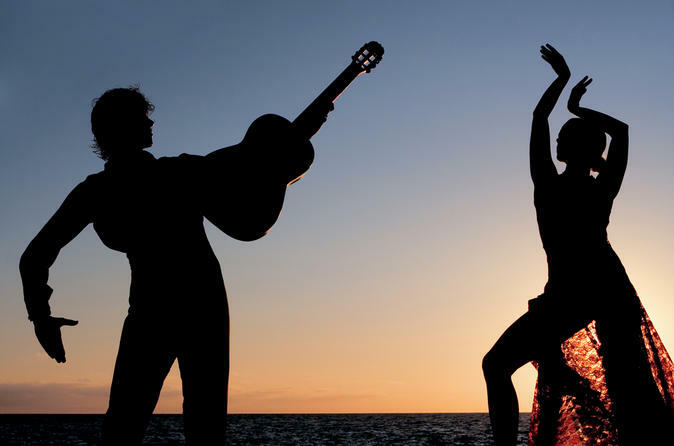 Learn the ins and outs of this fiery, passionate dance and get an insider’s look at the flamenco show. Once your blood is pumping, take a seat in front of the restaurant’s stage and enjoy your drink (a glass of wine, sangria or soda) or — if you have upgraded to include dinner — feast on three courses with wine. See the Itinerary for a sample menu. Next, watch your teacher and a troupe of Madrid’s best bailors (flamenco dancers) perform a heated flamenco show to live music from the tablao’s musicians and singers. Watch in awe as your eyes struggle to keep up with the fast-paced choreography. Performed with amazing elegance and power, stamp your feet and clap along as you resist the urge to join the dancers on stage and show off your newly learned moves.